Love me, love me. Say that you’ll love me. GO BIG OR GO HOME! If that’s your motto, then I’m your dog! 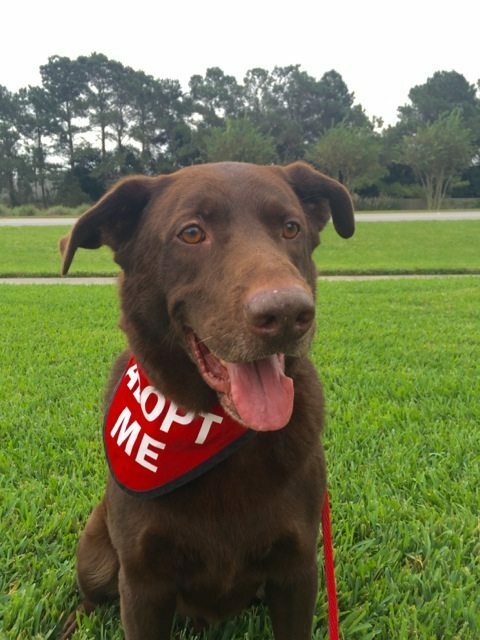 I’m Gunnie, and I’m a sweet 3-year-old, 75 lb, Chocolate Lab mix. I have been described as EXUBERANT and FUN-LOVING! That’s because my heart is SO ENORMOUS and my potential for devotion is PRACTICALLY BOTTOMLESS. Sing in the car? Loudly? Off-key? Snore? Talk in your sleep? Bad bagpipe player? No judgement here. I will just love you even more! I need a home with space to play and exercise and a person who will appreciate my goofiness and show me kindly and firmly how to be the kind of boy they want me to be. I really do want to make my person happy! I am house broken, healthy, have been neutered, microchipped and am up to date on all my vaccines. I will be at Pet Supermarket Ponte Vedra this Saturday and Sunday from 10am-4pm. Call 703-795-3070 for more information or visit the S.A.F.E. website: http://www.safe-pet-rescue-fl.com.